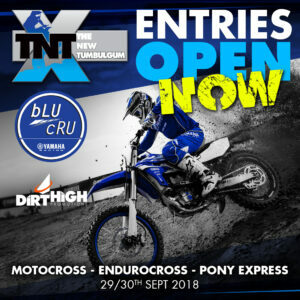 Entries are open for the second TNT held at the WA Ride Park. The Event on the 29th and 30th September will be a unique event on the WA calendar as it allows riders to experience three different disciplines of motorcycle sports. Motocross on Saturday run over 4 rounds for Junior and Senior riders. Endurocross as a Non-Competitive event to allow riders to try their skills at this higher skill level discipline. Pony Express or Cross Country depending on entry numbers on the Sunday juniors over a 2.0 hour period and 3.0 hour. Camping is available, Food and Coffee vans will be onsite for the weekend. There will be no Bar so your welcome to BYO.